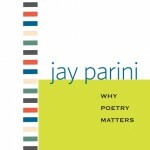 Parini goes on to describes in elegant yet accessible prose how poetry provides “a language adequate to our experience.” He argues poetry challenges the reader to interpret metaphor and the subtleties of our always morphing language, allowing us to discuss the intricate relationships of self, history, literary tradition, religion, and nature. With constant reference to a wide array of poets and poems to underscore his argument, he elevates his book to one of linguistic and poetic theory, rather than mere boosterism. Though it is unlikely Parini’s book will create many “poetry converts”, Why Poetry Matters is a refreshing book about the (non-monetary) value of poetry to those willing to accept the challenge (and invest the time) to understand it.